Stay hands-free on your run with the Nathan Hipster Waist Belt. With plenty of room to store your phone, slim wallet, and keys, this waist belt allows you to focus on your breathing and stride. The simple step through design fits securely as your on your run, and the individual pockets keep everything separate and organized so you can always find what you need. "How do they fit. I bought one earlier It was too small. Waist guides? " "Per our store, the small is about a 27 inch waist unstretched and the medium is about 30 inches unstretched. " "what is the difference between a Nathan hipster waist belt and the Nathan running belt"
"The Nathan HIPSTER Waist Belt does not have zippered pockets. 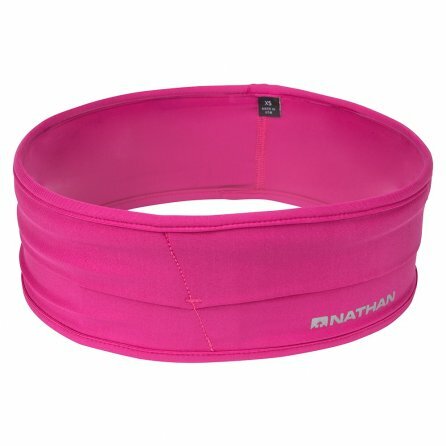 The Nathan ZIPSTER Running Belt has 2 zippered pockets. Both belts have four pockets. Hope this information helps!"